Musicians who travel the countryside by bicycle are rare, but not unheard of. It’s relatively easy to stash a cornet into a saddlebag or sling a banjo over one’s back. It’s no secret that some women can suffer the same numbness in the genital area as some men do from riding a bicycle. For men that can lead to erectile dysfunction and impotence, serious issues that can be addressed by professional bike fittings and alternative saddle styles. Now researchers at Yale University School of Medicine have found a solution for women suffering numbness — set the handlebar higher in relation to the saddle. I've attached lots of different lights, pedals, saddles, handlebar grips and other gizmos and gadgets to my bike or myself in the past 10 years. The one thing that's given me the most pleasure is a simple rectangular eyeglass mirror that cost me less than $10. Like my helmet, I can't leave home without it. That's the mirror in the photo at left as I'm being trailed across Kansas by my son this summer. 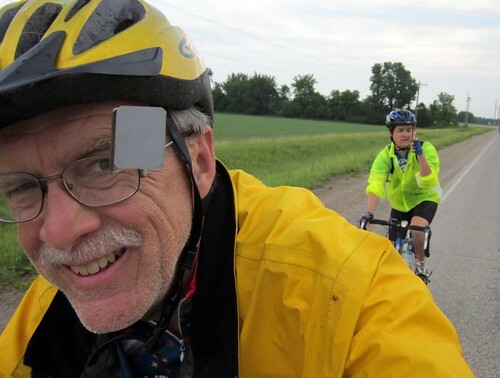 If you're searching for a holiday present for a bicyclist, a mirror would be a good choice. Any local bicycle store will have a good selection…. The art of fitting a bicycle to a rider has come a long way since I first realized that some of my aches and pains were caused by poor fit. For my style of riding — getting from Point A to Point B without unnecessary discomfort — there are a couple of measurements that seem adequate. But racers and competitive amateurs seek adjustments that will give them an edge. When you're plucking down several thousand dollars on a new bicycle, another couple of hundred doesn't seem like much to pay to get the most out of it. The snow-covered Olympic Mountains — about 70 miles away as the eagle flies — and Lake Washington provide a scenic backdrop for these cyclists out for a bike ride New Year's morning. Lots of bicyclists hit the road in the Seattle area on Saturday in spite of temperatures that hovered around 30 degrees all morning. You might find it inspirational to learn that an 88-year-old man won three gold medals at the Connecticut Senior Games earlier this year. But the back story for cycling enthusiast Bob Sawyer is so much more amazing than that. A year earlier, the Bedford, Massachusetts, man had been hospitalized with lymphoma, complicated by pneumonia and the inability to eat because he could not swallow. His doctors had discovered the lymphoma on a CT-scan after he suffered a cerebral hemorrhage.